In Google has become so popular in the dictionary of world; in 2002, the Google was the word that frequently and mostly used throughout the year. It is a private company held in 1998, by the Sergey Brin and Larry Page, while they were student at Stanford University. Google has the offices in 14 states, in 36 countries. Google have many services for the people across the world, there are variety of product and services, Google love to serve everyone want to satisfy the clients and as well as the employees. Google is very famous in managing its employees, Google have fast paced work environment, for the growth and value of the employees. Google employees are sincere to the work environment; they are hardworking because they want to see the Google to provide best services to the people across the world. The Google fully know how to train and retain the employees, the environment of Google support the creativity and innovation, the Google has given free hand to the employees, so they can help the company in making new technology and adopt new skills (Google). Google allowed its employees to play games within the company; there are very favorable conditions inside the Google Inc. the employees can play on beach, pool tables, table tennis, video games etc. By giving all facilities and freedom to the employees they are making the employees able to care for the company, and participate in development, when the employees know that company do care for them, and they are respect and given value in the company, there performance would be effective, and they also value the company. There are HR program and policies that provide the valuable opportunities to the employee, so they can grow. The culture of the Google Inc. is based or built on the Qualitative and Quantitative data, means there are always testing and evaluation of the employees, it is done to find the ways that how they could be optimized. They want the effective performance of the employees and want to see them happy; the all system of Google is based on data, which is used to improve the employee’s productivity. In the culture of Google Inc. the employees feel very comfortable, as they know their company value them and they have worth. There are free lunches meals; free snakes for the employees, every employee could enjoy the meals, however, there are lunch lines so the employees do not meet anyone new, according to the Google, the 3 or 4 minutes are given to employees to collect their food, otherwise they could waste the time (Google). There are lunch tables also so the employees can meet and so the people or employees could know about each other’s. It was estimated by the Google that women are leaving the company, at twice rate than anyone else, so the new mothers are now give 5 months paid off leaves, so they can take care of their babies at home, this results in the 50% reduction in turnover rate. For the new employee the environment is more favorable, as the older employees guide and encourage them, so they can get comfortable with the environment. New employees are warmly welcomed and greet, a manger greet new employees, like how are you? Nice to meet you etc. it is estimated by the Google that there is 15 % increase in the effective productivity of the new employees, after the 9 months of their joining. They believe to arrange dinner booths or tables, for facilitating the creativity, the manger Laszlo found that to promote creativity and innovation dinner booths are better than the conference rooms. Mangers think that through little opportunities there could be creativity. Employees are backbone or assets for ant company, thee employees at Google inc. are happy with the environment of the company, as there are benefits for them, according to the survey and feedbacks of the employees, they are comfortable with the environment there are chances of growth, they do not to leave Google. The pets of employees are welcome in the Google, the employees say that it is hard top leave the Google, as our company is supportive for us and provide us facilities, there are quite rooms for the employees, where they can rest or take a nap. There are fish tanks, with beautiful fishes, one really feel proud to be a part of Google. The innovations are appreciated, there are compensation programs like deferred profit sharing plans and pre-tax savings account etc. The benefits and perks are provided to the employees, the employees have reorganization and they are valued within the work environment, there are equality within the employees, no employee ins inferior or superior, the rewards and bonuses are given on the hard work (Carson). The management is very cooperative with the employees, this is the reason the employees are satisfied with the working environment, and the relationship is positive and strong. The employers known their responsibilities and they encourages the employees, they tech employees that it is there responsibility to please the customers, there is good communications within the Google Inc. the employees are trained through the workshops, training programs, seminars and other activities. There is no negativity in the workplace, the mangers have the clear vision and strategies for the team, the employees are helped in the career development, the employees are productive as the mangers are results-oriented. There are teachings in the training programs, the employees are admired and given advantages on the better performance, and the relationship between managers and employees is impressive as it promote the innovation, as there is open and honest communication (BRYANT). The employees are engaged in decision-makings, the feedbacks on different aspects are provided to them, to improve their productivity the employees are appreciated, the management try to resolve the conflicts, take place within the group members or between the mangers or employees. The employees are given favor, based on evidence and truth the issues are conflicts are resolved, the employees have to follow the orders, or instruction given by the managers; managers are respected by the employees; and managers try to overcome the weaknesses of the employees. Managers know that if favorable condition and appreciation is given to employees, ultimately the productivity will be increases, the managers believe on team building they provide proper guidance and the resources that are demanded by the employees. In Google Inc. all leadership styles are implemented to motivate and value the employees, to promote the vulture of the organization and to reach the desired goal, it is important to promote the leadership styles in an organization, as Google is very concerned about its employees. The employers and managers take every possible step, for the completing the departments and employee’s needs (Gill). The leaders follow the style laissez faire, in this style the employees gave the significant autonomy to take the decisions, the employees have the power to manage their work, they independently manage all the tasks, there is less conversation within the leader and employees and the employees are highly motivated and trained to work in a small groups. In Google Inc., the teams of employees are motivated to take their decision according to the need of time. There is autocratic style, which is followed by some leaders in Google Inc. the autocratic leadership style allow the mangers to take decisions alone, the total authority is given to the leaders, no one challenges the decision of the leader. In the Google Inc., many decisions are by the mangers without concerning or participations of the employees. However, in some decisions employees can provide their point of view. The employees are participative at some level of decisions, the managers do not take the decisions alone, the employees are concerned before taking the decisions, there is input of team members, as the employee morale is boost through, involving them in decision, and they will feel important in the organization, the value is given to employees at Google Inc. The transactional style is also followed by the leader of Google Inc., the leaders give the rewards and punishment, based on the participation and performance of the employees, the employees are concerned and given respect at Google, so they are given rewards by the leader when the accomplish the goal or tasks. The transformational leadership style can provide many benefits to any company in the case of Google Inc. the leader also follow the transformational leadership style, as there is high level of communication, between the employees and managers, to enhance the productivity and reach the goals. The mangers provide the relevant feedback to the employees that are significant for their work performance, Through communication, the way to enhance the performance and management to meet the goals, by the leaders are provided to the old and new employees, the managers provide the employees with the big picture that how the goals could be achieved (Manimala and Wasdani). 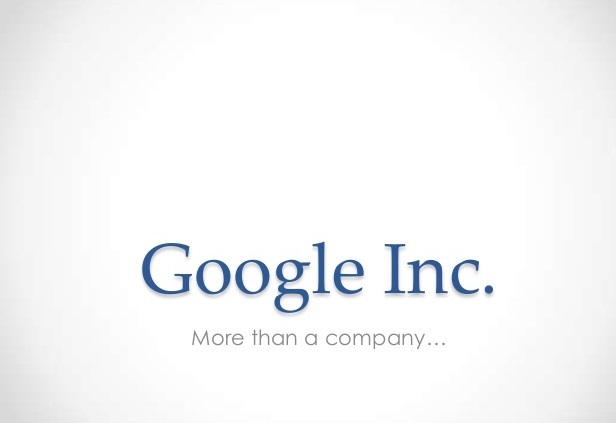 There are positive impacts on the employees; the effective leadership programs by the leaders are very helpful for the employees, the official motto of the Google Inc., is that they “do not evil with the employees”, to maintain this saying there are policies and corporate decisions, which support this motto. The leadership impacts on employees, in the New York Times article, the employees were interviewed and they said, they have sense of love for the company, and they feel being personally invested, by the company and the company mission is their own mission they want to word for the future success of Google Inc (MIMS). The leadership is proved efficient and effective in Google Inc., the employees are satisfied from the managers, as mangers involve them in taking decisions and all other related matters. The leadership is effecting employee and motivating them to support the organizational goals, the employees discuss issues and conflicts they and facing, the problems are also discussed; the best solutions are provided to the employees by the leaders. The Google Inc. is developing the employees behaviors, through encouraging them and involving them in the organizational matters, the employees are admired and provided by the necessary guidance that could be helpful in developing their behaviors. The employee behaviors matters to reach the organizational goals, the employees are sincere towards their work. They want to give best services to their organization, the employees have the sense of innovation; there is focus on the innovation in the culture or environment of Google Inc., the effective leadership skills and benefits that are given to them are motivating them to perform better, Google Inc. is efficient in developing the employee’s behavior through encouraging them (Google). Employees are involved in regular communication practices, there are staff meetings, through which the employees feel themselves engaged in the business and organizational matters. In the meetings the employees are encouraged to share their innovative ideas, at Google Inc. the employees have the power to speak against things, they are not satisfied. The feedback is given by the management, after listening to the employees; the employees are also guided through online services like e-mails etc. The management of Google Inc. is a good listener and indicates openness, for the employees, to communicate. Employees are involve in all the matters, to maintain the employee’s involvement towards the work, and towards the organizational performance, Google Inc., follow the 70/20/10 rule, under the rule, there is 70% of everyday work is involved, 20% work is done for the new ideas or new projects and 10% work is done on peruse the idea. Through this rule Google Inc. keep indulge their employees, and they are forced to show effective and innovative performance through this rule. The employees are involved in decision-making process, according to Google Inc. the employees are needed to involved to enhance the productivity, the employees are empower through involving in the decisions making process, and the company contributed towards success. The value and morale of Google employees are boost through involving them, the employees show positive and constructive attitude and they will be satisfied if they employees are concerned in decision-making processes. The environment at Google is focused about the training and development of the employees, to maintain, retain and train the employees is there basic purpose, it is believed that older employees can perform better than the new one, however new employees can bring innovation and thinking in the organization. To train new ever-old employees should be the focus of every organization (Yarow). Training programs can help the employees, to identify their skills, at Google, specific time is given to the employees so they can recognize themselves and can bring innovative effective ideas for the organization. The skills of employees could be identified through focus on the employee growth; the future performance could also be effective (Noe). Google Inc. also focused on the personal values of the employees, as if they want employees to be adaptable with the changing environment, personal values could be like, attitude, evaluation, talent, ability, skills etc. To enhance the personal values of the employees there are various functions that support it, like careful constructing of job and 20% work etc. At Google Inc. for the motivation of the employees, incentives are given to the employees. There are various methods that are used for the motivation of the employees, the facilities in the Google includes free haircut on the site, and employees can use gym, which is filled with equipments, to cut off their calories. There are swimming pools; lifeguards are on duty all the time, to safe the employees. Google have also provided with the laundry facility, if there is any mishap with the clothes. Google has provided many facilities to the employees, so employees can be motivated; employees often motivated by providing the rewards when they show better performance. There is much focus on the employee contribution; employees are motivated to participate in the organizational functions, Google believe that participation of the employees can bring sense of innovation in the company. Google Inc. is best at managing all the functions of the HRM; different strategies are involved to address the employee’s needs, there is recruitment, planning, forecasting, evaluation of the employee etc. 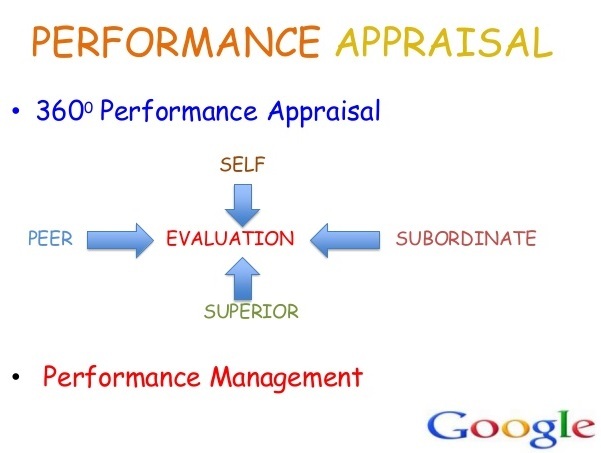 There is performance management in the Google; the employees are evaluated on their performance. As creativity is, important aspect at Google so there is also appraisal system from the innovation perspectives. The performance of the employees are evaluated on the fairness basis, they maintain the high standards of the measures, they always emphasis on the excellent performance from the employees. 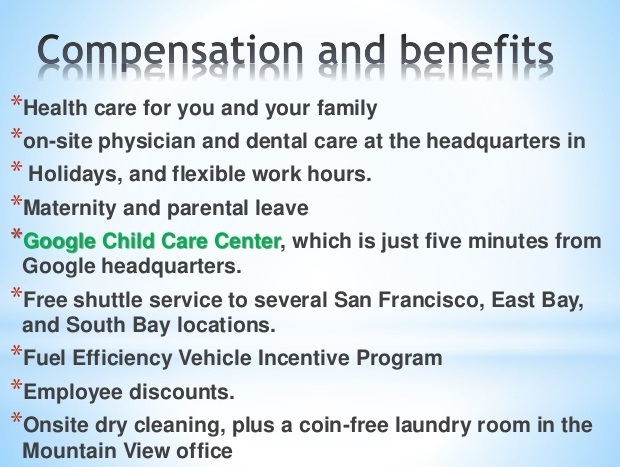 The rewards and promotions are based on the appraisal system, the best performer is given the rewards or incentives, and special rewards are given to the highly motivated and competitive person or employee, Google provides the medical insurance, retirement pensions, exercise equipments and free meals to the employees. Employees and organizational needs are identified for the development of the employee at Google Inc. the appraisals and interviews, provides the information to the HR managers that what is required for growth and development of the employee. The maximum support is provided to the employees, at job level, organizational level, team level etc (LOMBARDO). There is need of the work-life balance at Google, there are long working hour in the company, the employees of Google spend at lot of time at office, they have no life outside the office. The timing or working hours of Google are, from 10am to 6pm, however, the office go at home with employees through the mails or cell phone. The working hours need to be limited, the employees are giving the facilities so they can efficiently participated towards the organizational goals, however, maximum freedom and facilities can exploit them. At Google Inc. managers and employees are given all the rights and the facilities, they have well-balanced systems in their company, for the growth of any company, especially for Google, innovation is important, and they provided the facilities to the employees so they can best participate towards innovation and do effort to achieve the organization goals. The management of human resource department is very effective; all employees are given the benefits based on the appraisals system. There is need to more focus on the employee needs, as employees can be distracted from the work, by providing them many facilities. BRYANT, ADAM. Google’s Quest to Build a Better Boss. 12 March 2011. 3 May 2016 <http://www.nytimes.com/2011/03/13/business/13hire.html?pagewanted=all&_r=1>. Carson, Biz. 14 words you understand only if you work at Google. 25 Sep 2015. 3 May 2016 <http://www.businessinsider.com/14-words-you-only-understand-if-you-work-inside-google-2015-9>. Gill, Eric. What is Democratic/Participative Leadership? How Collaboration Can Boost Morale. 15 Jan 2016. 3 May 2016 <http://online.stu.edu/democratic-participative-leadership/>. Google. Google’s mission is to organize the world’s information and make it universally accessible and useful. 2016. 3 May 2016 <http://www.google.com/about/company/>. —. Our Culture. 2016. 3 may 2016 <http://www.google.com/about/company/facts/culture/>. LOMBARDO, JESSICA. Google’s HRM: Compensation, Career Development. 25 Auguest 2015. 3 May 2016 <http://panmore.com/google-hrm-compensation-career-development>. Manimala, Mathew J. and Kishinchand Poornima Wasdani. Distributed leadership at Google: Lessons from the billion-dollar brand. June 2013. 3 May 2016 <http://iveybusinessjournal.com/publication/distributed-leadership-at-google-lessons-from-the-billion-dollar-brand/>. MIMS, CHRISTOPHER. At Google, the Science of Working Better. 29 March 2015. 5 May 2016 <http://www.wsj.com/articles/at-google-the-science-of-working-better-1427673486>. Noe, Raymond. Employee Training & Development. McGraw-Hill Education, 2012. Yarow, Jay. Google just announced a massive overhaul of its business structure. 10 Aug 2015. 3 May 2016 <http://www.businessinsider.com/google-new-operating-structure-2015-8>.